The magic of realistic facial hair happen when a transparent sticky liquid is applied to the skin which is undetectable to the human eye even at close range – only an unusual smell can sometimes be present. On the screen, in pictures or from an audience any smell will of course be non-existing – and perfume has been used since 3-5000 years in ancient Mesopotamia and Egypt. The art of creating realistic wigs and beards from human hair is also purportedly as old as Egypt – which might not be a reliable historical fact by itself but that might indeed indicate how the mastery of fake hair is quite ancient. In recent times, pertaining to female to male (FTM) transgenders, it would of course make most sense that there no longer would be any reason to use such artefacts. Except if you are a perfectionist that is, and practically leave and breathe for your craft. Not surprisingly, secretly transgendered individuals do indeed live and breathe for their inverted gender role and thereby might not be shy of using every method available to come across as convincingly as can be – so what better than a fuller than full beard or moustache to appear manly? When looking closer at Elite Gender Inversion it is sometimes difficult to keep in mind we are facing expert impersonators who mostly operate in the very profession where there is access to the best artists and techniques to help them perfect their act. As much as film directors, art directors, photographers and choreographers will create the right setting and storyline – the actors are all prepared by expert hands before entering to the scene. And the stage of a lifetime actor is not merely the artistic production they are part of – it also includes their own character offstage. To the Elite, their entire life is staged and managed, so whenever they come into the public eye, they perform their lifetime role and are well prepared to do so. Initially it seems trivial to be able to draw a line as to when Hormone Replacement Therapy (HRT) became efficient enough for fake facial hair to be irrelevant to secret transgendered individuals. There are plentiful examples online of openly transgendered individuals that all can testify to the effectiveness of hormones relating to facial hair growth. In each case it seems that facial hair (and body hair) start to grow quite quickly into the hormone therapy treatment. The results seem to vary, but often the hair-growth will first be limited and follow the the underlying bone-structure, and thereafter become fuller and in some cases even more dense than even in natural men. In other cases, it seems that facial hair remains troublesome for FTM individuals as they either do not develop enough facial hair on the ‘fleshy‘ parts of the face, or that they over time cycle in and out of hormonal therapies with varying degrees of hair growth according to their cycle. There does not seem to be any particular point in time when we can definitely determine artificial facial hair has ceased to be used by Elite Gender Inverted individuals – there might in fact be a number of celebrity actors that still today use theatrical makeup to achieve their plentiful beards – not only on film. It is actually quite astounding that most of the available information on professional fake beards and the technical knowledge behind it remain difficult to find. Not only does available videos use older types of glues and adhesives, most examples seem go to considerable effort to make quite a poor job of it. The most commonly seen examples are Beastie Boys ‘Sabotage‘ style portrayals (and close to Santa Claus quality). As the excellent film ‘The Prestige‘ effectively told the audience – the secret of a successful magick trick is not to be revealed as both Angier and Borden (one twin) proved – to the cost of their lives. Todays theatrical techniques are very elaborated regarding fake facial hair and might seem close to impossible to resist for a perfectionist lifetime actor. Celebrity EGI individuals of the past often tended to overdo their facial hairdo’s – but the modern impersonators seems to not shy away from putting poor beards to good use as such apparent ‘miserable‘ appearence will be furthermore convincing to the unwitting bystander than the overly long and dense style of their celebrity predecessors. As it can be suspected Elite individuals still make use of fake facial hair even today, it must have been prevalent in the past when Hormone Replacement Therapy (HRT) was not as reliable and potent as it is today. To a female-to-male EGI individual, beards and moustaches are as gender-affirming as breasts-implants would be to a male transgender. If we consider that most Elite MTF transgenders indeed use breast implants, we might equally suppose that most female to male individuals (FTM) would make use of fake facial hair – especially in the past. By deductive logic, we might therefore consider bearded celebrities of the past to be suspicious and more-so the further back we go in history as the reliability of fake facial hair techniques are longstanding and the complete mastery of performant hormone therapies recent. As much as it is counter-intuitive to look for famous men with the fullest of beards from the past as highly suspicious, it is however very logical. Feelings will no doubt get in the way of pertinent conclusions and many will protest using loud voices and foul language – still, famous bearded men have indeed lied to us before on many occasions – and some of them might not even be men at all. 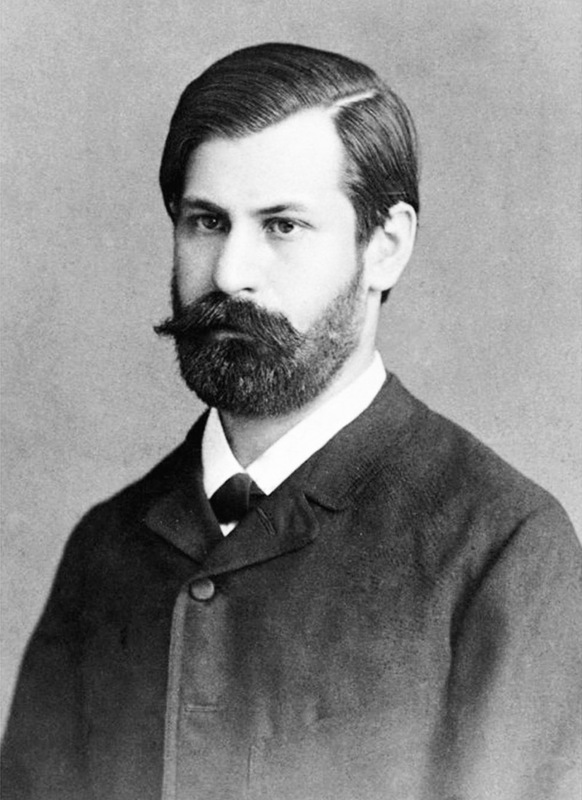 Sigmund Freud (1856-1939), the founder of psychoanalysis. In addition to being an avid cigar smoker (cigar article here), Freud is most likely an Elite Gender Inverted character that made lifelong, consistent use of a fake beard to better impersonate his role of a virile man – all while being born female. • The hair stylist seems to have improved over the years but the unmistakeable signs of fake facial hair are ever-present in imagery of Freud. The picture above clearly demonstrate how excessive amounts of hair was used on a face that merely can hold decent eyebrows and displays very feminine dermal quality and softness – the exact opposite of a man with dense facial hair growth. 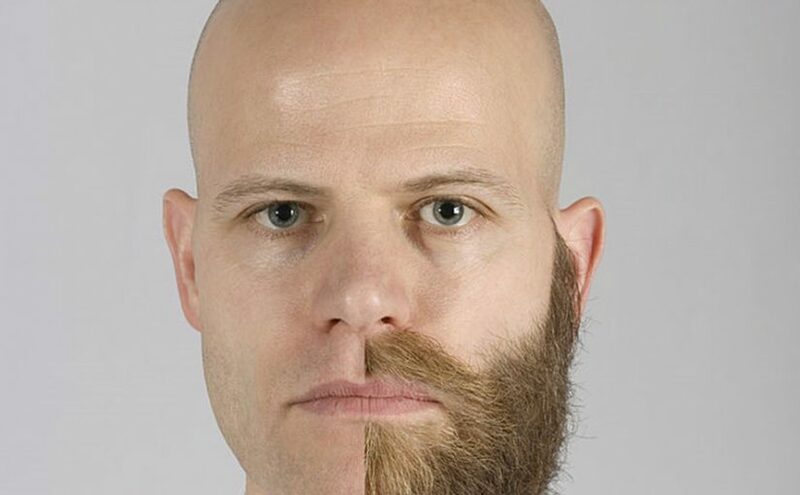 Fake beard – fake gender.